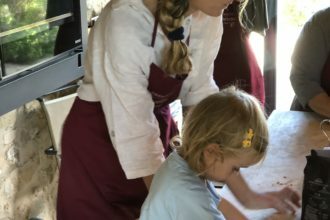 A week at Fontanaro: some tours ideas – spend a week at fontanaro and enjoy the best of Tuscany and Umbria, follow our Umbria Tuscany review for more updates! Most of our guests love to come to Fontanaro for a week or two. There is so much to do in this area, We personally haven’t even tried it all yet! What to do in Tuscany and Umbria ? Some of our favorite things to do are visiting the different cheese factories, the wineries (as I am a sommelier) and to try new restaurants. The food here I believe is one of the best in the world and I am happy to share with you my favorite places to go. Fontanaro is located on the border between Umbria and Tuscany which gives you the opportunity to explore both regions. You can visit small charming Hill Towns, go to the lakes, go horse back riding, enjoy the many hot springs in the area and if you are into shopping you have several outlets to choose between. If you like big towns you can even go to Florence or Rome as day trips! Or Montalcino, Pienza, Siena, Orvieto, Assisi, as a half day tour. If you like sports you can play tennis, go biking, trekking, air balloon .. as you can see there is so much to do here! My mother and myself cannot wait to be a part of your experience here and make sure that you will return home with memories that will last a life time! Arrival at Fontanaro in the evening. Enjoy our eco infinity swimming pool to recover from jet lag and visit our wallet Medieval village of Paciano and Panicale. Go shopping here around and relax with a lovely dinner at home with free delivery from our restaurant Oca Bruciata that reserve you 10% off or go at a short walking distance to La loggetta restaurant, a lovely romantic place inside a Medieval tower at the village. 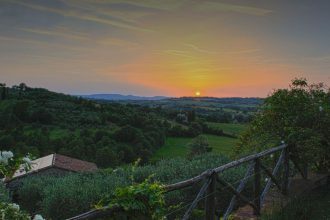 Or if you like go at Il Casale to enjoy a stunning sunset dinner. WINE TOUR: MONTEPULCIANO – Ask us to book the best wineries or choose the one you like from our winery list in the blog. We really like Cantina del Ricci, (inside Palazzo Ricci, few steps from Piazza Grande), here you can have a light lunch with pair with wines inside one of the oldest city buildings. Mr. Enrico the owner and his staff are so nice and they will do their best to give you a memorable wine experience. You will also visit inside the same building am Etruscan well. If you order wines here you will receive the 20% or 25% off!!! This is one of the best deals of the area in term of high quality/good prices. CANTINA DEL REDI HAS BEEN REVIEWED AS THE BEST WINERY OF THE WORLD BY BBC INT. In Montepulciano don’t miss a visit to Cesare one of the last Copper man in Italy and enjoy the city. A NICE IDEA IS ALSO TO LUNCH @ ACQUACHETA – Via del Teatro, 22 – Montepulciano Siena. OR even better lunch at LA GROTTA in Via San Biagio, 15 Tel. 00 39 0578 75 74 79. It is located front of the world famous SAN BIAGIO CHURCH. (OUTSIDE THE CITY). It was built by Antonio da Sangallo the Elder between 1518 and 1545 and is a masterpiece of the sixteenth century Tuscany art. The origin of the church is tied to a miraculous event took place on 23 April 1518, when two women and a shepherd, passing in front of a fresco depicting the Madonna and Child in her lap and St. Francis, saw that the Virgin’s eyes moved as if she was alive. In the evening: Cheese Tour at the one of the real 100% organic farm of Val d’Orcia (this is the Valley protected by Unesco). The farm name is IL CASALE. To be booked before. – Introduction from the owners as to how the famous Italian cheeses pecorino, caprino and ricotta are made. – Tour of the farm with a short visit of the dairy and of the views looking over the Orcia Valley. – Tasting and explanations of the various types of sampled cheeses. – Duration: from one hour to two depending on the curiosity of the guests. Morning @ AVIGNONESI vineyard, one of the best wine of the world, rated this year in the 100 best by Wine Spectator. Evening in CORTONA AND DINNER AT OSTERIA DEL TEATRO, ONE OF THE BEST!!! It is located in Via Giuseppe Maffei, 2 TEL. 00 39 0575 630556, better to book before! MONTALCINO WINERIES + BAGNO VIGNONI AND THE VAL D’ORCIA. Casanova de Neri (Podere Fiesole 53024 Montalcino Siena Tel 0039 0577 834455) that is is one of Tuscany’s top–rated wineries on the international stage. + il Paradiso di Frassina When you arrive at Paradiso you will feel completely immersed in the harmonies of Mozart, resonating gently along the vine rows and across the hills before you. To book: tel + 39 0577 839031 – Where: Loc. Frassina, Montalcino, Siena. Remember to visit also the Sant Antimo Church outside Montalcino. Enjoy our slow cooking fun and educational class where you will learn how to make hand made pasta, and some of the best Italian dishes, and learn about the art of making great olive oils and how to taste wine in a professional way! AND @ SUNSET why not a COUPLE MASSAGE at your home or at the eco infinity swimming pool. ASSISI TOUR + Gubbio or Perugia visit. To book the monks tour -0039 -075- 8190084= Information Office, Assisi ( or you can call directly). The guides are Franciscan friars. They are not always available, but when there is someone available, it is certainly worth your time to arrange your visit to the Basilica with one of these people. There is no charge, however, a donation is appreciated at the end of your visit: Perhaps Euro 10 per person. Assisi is an astonishingly beautiful medieval hill town of Umbria. 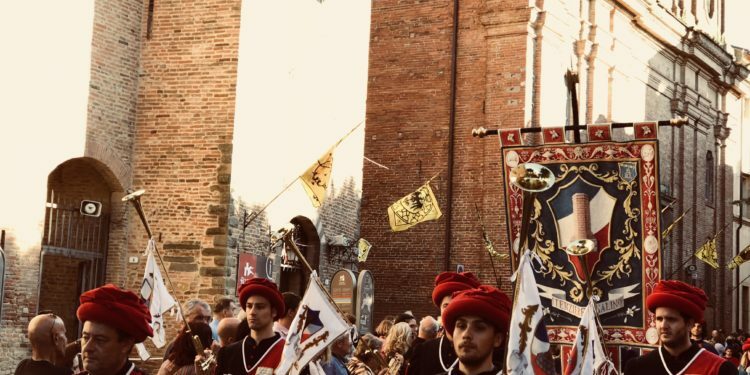 VISIT SIENA – Tour of the city. The best is for us going up to the top the tower in Piazza del Campo and watch the delightful panorama of the city (remember to have with you the camera). – A visit to the cathedral and Baptistero of Siena. AT ARNALDO CAPRAI IN MONTEFALCO, ONE OF THE BEST OF UMBRIA! This tour lasts: 1 hour. For those who don’t have the time for a complete visit of the winery but still wish to taste our wines, the Enoteca is opened for tastings of current vintages of Grechetto, Montefalco Rosso and Sagrantino. If you didn’t plan ahead, don’t fret. Stop by the enoteca anytime to purchase your favorite Arnaldo Caprai wine(s).